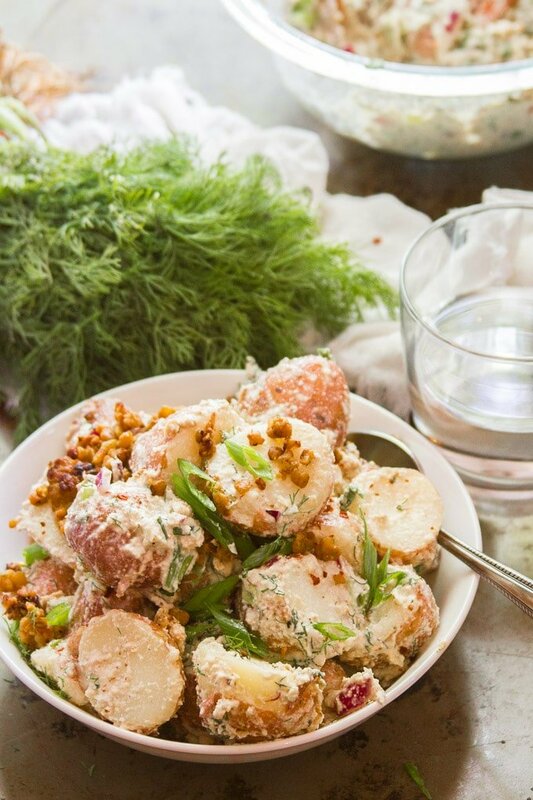 This luscious vegan potato salad is made with tender red potatoes in luscious cashew dressing with fresh dill, scallions and a (totally optional!) 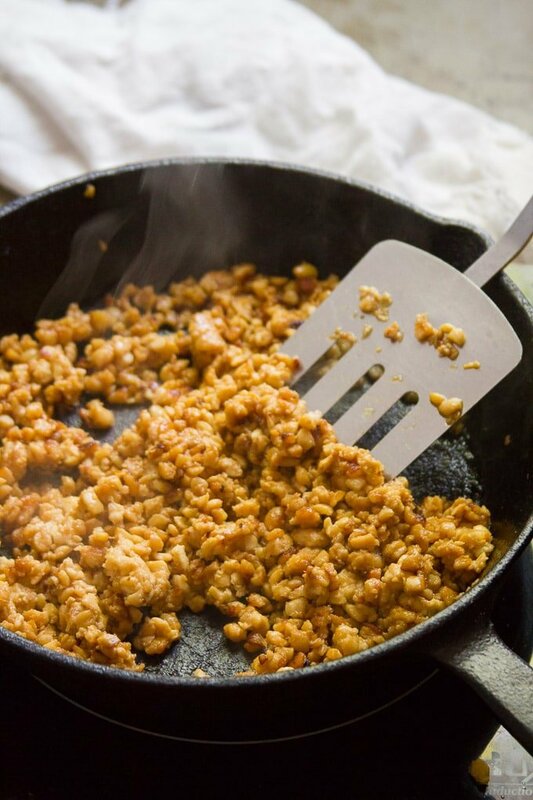 sprinkling of tempeh bacon. Rich, creamy, and packed with flavor! 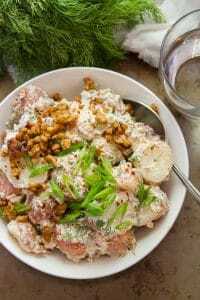 When I first went vegetarian, I made many-a-meal out of items from the local supermarket deli case, and one of my favorite things was a Scandinavian potato salad that was loaded with dill, cottage cheese, sour cream and red onions. I cringe to think about it for now, but that was my dinner, as in, like, my whole dinner, several times a week. This version is vegan, and considerably lighter. I still wouldn’t advocate making an entire meal out of this, but it’s definitely a delicious side, and it’s at least as tasty as my old favorite from twentyish years ago. The dressing for this one is made with raw cashews, and I’m pretty confident that it’ll fool any dairy eater. Just soak them in water to soften up, then blend with a bit of non-dairy milk, red wine vinegar, garlic and Dijon mustard. I also went and added a sprinkling of vegan bacon, just because. I’m not sure if that takes away from the whole Scandinavian aspect of the dish (I know pretty much nothing of Scandinavian food), but it’s super tasty and adds a little protein to the dish. I feel like I miss out on protein at most cookout meals, so every little bit helps. To make the tempeh bacon for this dish, you’ll just crumble up a block of tempeh, soak it in a smoky marinade, and pan-fry it in a bit of oil. It’s delicious and you just might want to sprinkle it on everything! For a quick and easy version, or if you just aren’t into the tempeh bacon thing, feel free to skip it. It’ll still be awesome. Mix the potatoes and dressing with some scallions, dill, and red onion, then dish it out and top with your tempeh bacon. If you forget to soak your cashews, just boil them in water for about 15 minutes. Save time on the day of serving by making your dressing ahead. It can be made a day in advance. 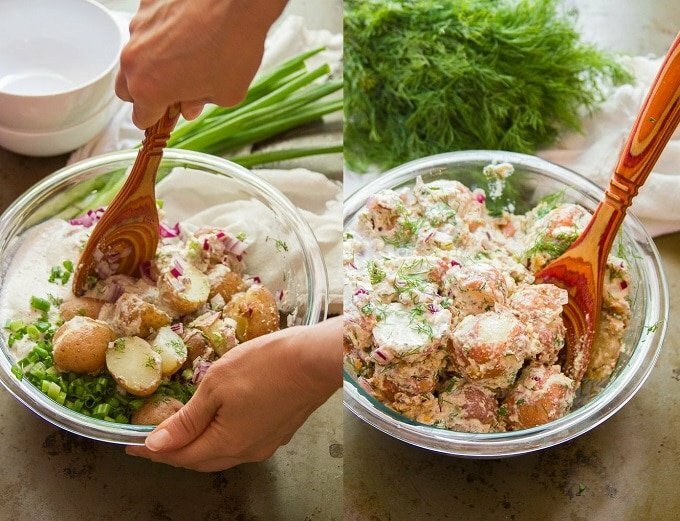 This potato salad will keep in the fridge for about 3 days. Not into tempeh? Coconut bacon would make an awesome alternative vegan bacon! Stir soy sauce or tamari, vinegar, maple syrup and liquid smoke together in a small bowl. Coat the bottom of a medium skillet with oil and place it over medium-high heat. Add tempe and the marinade. Cook until most of the liquid has cooked off and tempeh is nicely browned, about 10 minutes, flipping once or twice. Bring a large pot of water to a boil. Add the potatoes, bring the water back to a boil and allow to cook until potatoes are fork tender, about 15-20 minutes. Drain the potatoes into a colander. Return them to the pot and allow them to cool while you make the dressing. To make the dressing, place the cashews, milk, vinegar, Dijon mustard, and garlic into a blender or food processor bowl. Blend until completely smooth, stopping to scrape down sides of bowl or pitcher as needed. Cut the potatoes in half, then place them into a medium bowl. Add the cashews mixture to the bowl, along with the red onions, scallions and dill. Stir until the ingredients are distributed and coated with dressing. Season with salt, pepper, and (optionally) red pepper flakes to taste. Cover and chill until ready to serve. Divide potato salad onto plates or bowls and top with tempeh bacon. Serve. Prep time does not include cashew soaking time. I don’t cook with oil. 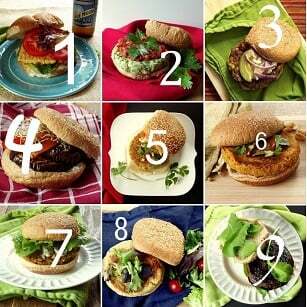 Can I bake the tempeh bacon? If so, can you tell me at what temp, and for how long, etc? I think baking it would work, but I haven’t tried it myself so I can’t say for sure. I’d try placing the crumbled tempeh on a parchment-lined baking sheet, setting the oven for 350F and checking every five minutes or so. I’d love to hear how it works out if you give it a try.